Creed frontman Scott Stapp has literally lived two lives in his 40 years, you might call it a Doctor Jekyll and Mr. Hyde story. Scott Stapp was the lead singer and co-founder of the highly successfull and influential rock band Creed, that formed in 1993, with the band selling an estimated 53 million albums worldwide and winning numerous awards including a Grammy. Stapp was living the rock and roll lifestyle to its fullest, with all of the successes and excesses. Eventually the excesses of addication and ego spelled the end of Creed in 2004. In 2005 Stapp released his first solo album The Great Divide, which has been certified 2x platinum, but Stapp's life was still spiriling out of control, as he had some well-publisized arrests and legal issues and he attempted suicide twice. The event that changed Stapp's life, as well as becoming a father, happened on Feb. 11, 2006, when he married Jaclyn Nesheiwat, Miss New York USA 2004 winner. As Stapp states, "I know in my heart that Jaclyn was put in my life by God. She is my angel, my rock." Stapp still battled depression and addiction, but Jaclyn never gave up on him, and through his family, and God, he has beaten his addictions. Stapp today is not only a husband, but a proud father of three children. In 2009 Creed reuinited and released a fourth album, with a tour supporting the album. In 2012 Stapp releashed a no-holds-barred autobiography titled Sinner's Creed, That chronicled his life from the beginning, all the successes, ruin, and redemption. 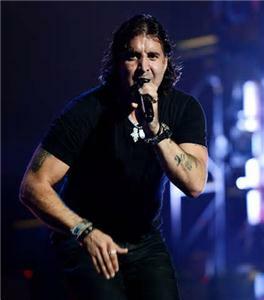 On Nov. 5, 2013, Stapp released his second solo album, Proof of Life, which has spawned a number 1 Billboard Christian Rock song, Slow Suicide, which is a first for Stapp. Stapp has stated, " I'm an older guy who's been through it all and seen it all. I'm sure I'll see more, but up to this point I really feel like I've seen it all. My perspective on everything is completely different, but it's so refreshing and it's so new. It's a total rebirth. I'm really, really excited about what this record stands for now and then the chapter that it's closed and what lies ahead in the future. I'm the most content that I've ever been in my 40 years on this earth and the happiest and the most full of just peace and joy than I've ever been. And I think life reflects art, art reflects life. Just being able to make a record from an organic place, from a place of inspiration and a place free of any negativity or any forcing, brought out the best in me as an artist. I really feel this is the best body of work that I've ever done to date. "I feel an obligation to share this story and to help others who are suffering. I can’t think of any other reason except to give back and walk others out of the darkness, man, so they don’t have to get to those lows that I got." Stapp was given a second chance, and oh how well he has done. He has taken a mess and turned it into an awesome message. From Success to Ruin to Redemption. He will be starting a spring tour next month, and he will be coming to Atlanta in April.